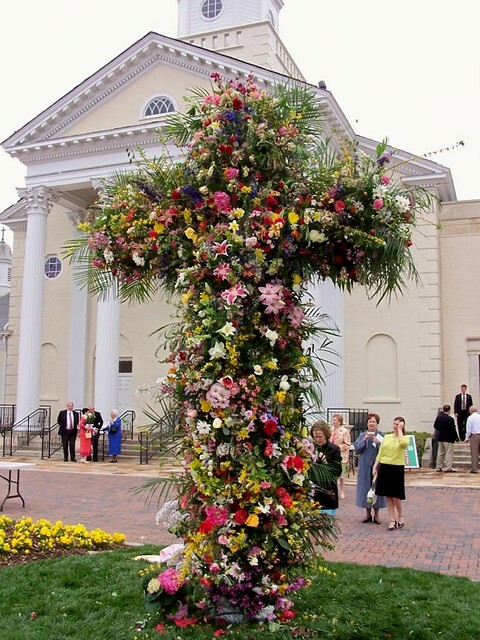 My church (Peachtree Road United Methodist) has a wonderful Easter tradition, the Easter Cross of Flowers. 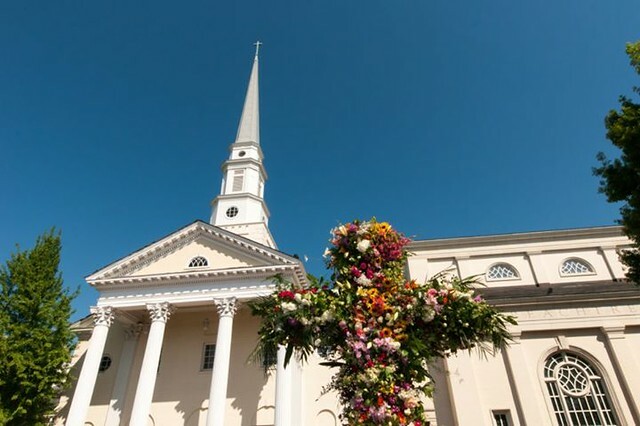 Everyone is invited to bring flowers and branches to transform a cross on the front lawn into a beautiful symbol of the Resurrection. I wrote about it a few years ago, and ever since then I receive about a dozen emails each year asking about this tradition and how exactly the cross is made. 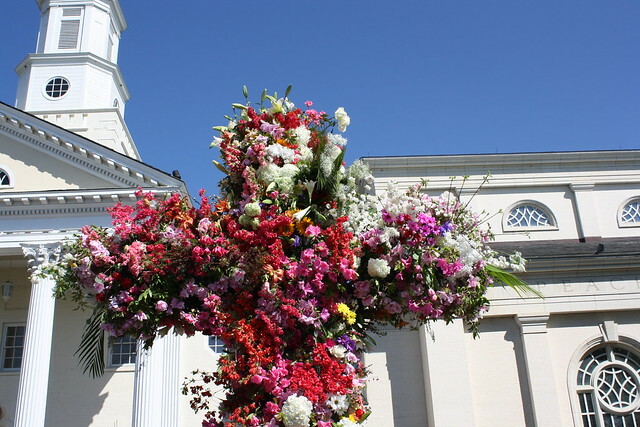 A view of the Easter Cross of Flowers on the PRUMC website. I went to church this morning armed with my camera so I could take some pictures. 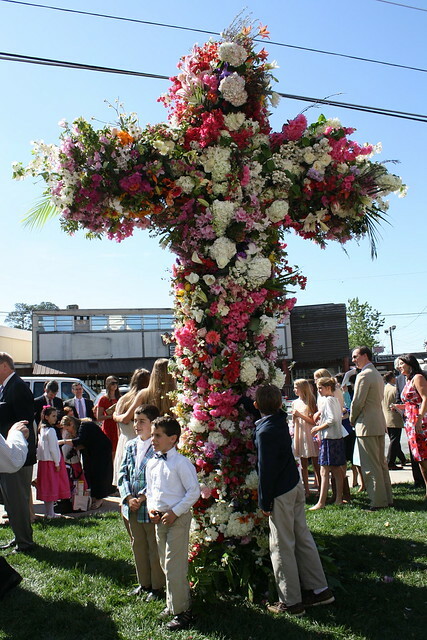 The Easter Cross of Flowers creates a wonderful photographic background for pictures, so it was impossible to get a full shot of the Cross of Flowers alone. However, I did get some close up pictures of the construction of the cross, so hopefully this will help those who have been inspired to create this at your own church on Easter Sunday. Here are some images of the cross from Easter 2014. We attended the 9:45 service, which is the third service of the day. Although the entire cross is worked on at one time, it looks like the top of the cross is the focus at the beginning; the ladders were removed by the time the 4th service was beginning. 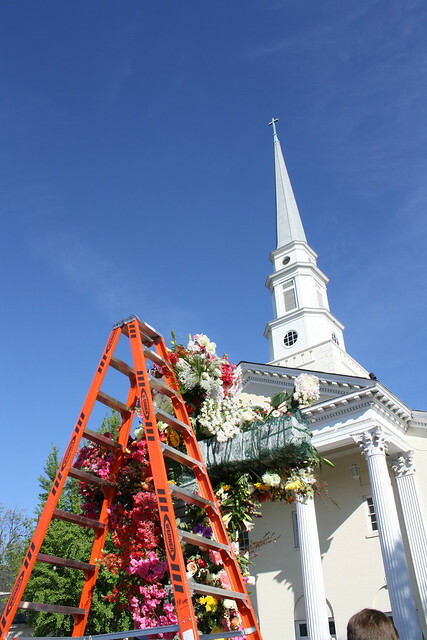 Church volunteers work on the top of the cross from buckets of flowers, and parishioners can add their own flowers to the spaces at eye level and lower. 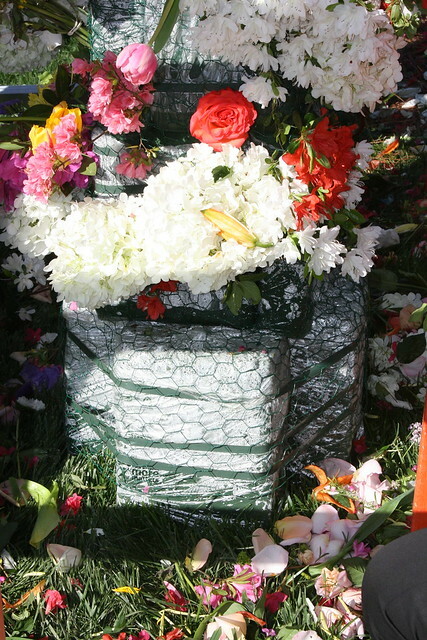 A close up picture of the structure underneath the flowers – it looks like the wood cross was wrapped and then covered with fine gauge wire so the flowers could be affixed to the cross. 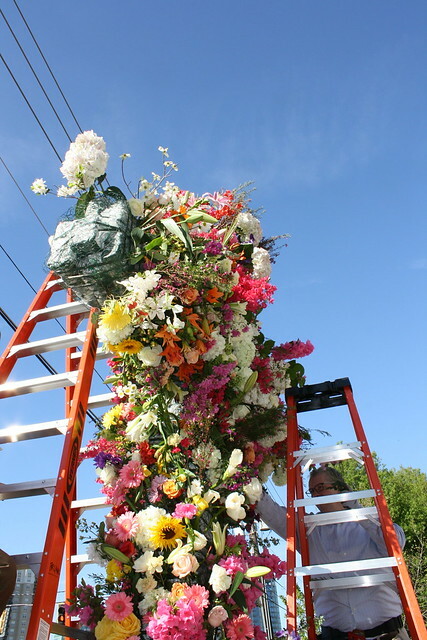 Another view of the underlying structure of the flower cross as it was being assembled. After church, it was clear that a lot of progress had been made; the cross is almost completely filled in and the ladders were removed. The weather was absolutely gorgeous, creating a lovely backdrop for the flower cross. I hope you and yours are enjoying this wonderful weekend – Happy Easter! That is just beautiful. Hope you and your family have a happy and blessed Easter. Happy Easter! Thank you for sharing this beauty. What an undertaking that is, and I'm sure it is just so moving in person. Brightened my day!! Wow! Thanks for sharing this amazing undertaking. Such a vivid and beautiful reminder of the season. A work of art, it's truly beautiful and so very meaningful. The time and dedication that does into creating this is such a testament of faith! 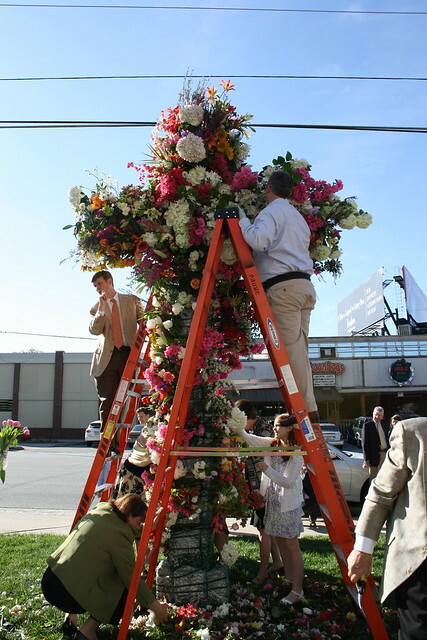 It is a beautiful way for the congregation to participate in making this gorgeous symbol of Easter even more meaningful! 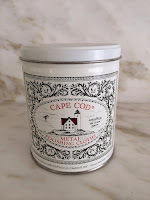 Lovely tradition, and a gift to the entire community.